When making a small batch for myself I use 1 cup of Epsom Salts, 1 Tablespoon of Baking Soda and 2-3 drops of Essential Oil. I generally prefer to leave mine white, but a drop or two of food coloring can be used to color the salts, or mica pigments can be found online or in soap making shops if you prefer a more natural way of coloring yours. Next, a container will be needed to present and store your bath salts. What better way to celebrate you and your partners "great chemistry" than by using test tubes? I have places mine into a graduated cylinder so they don't go rolling all over the table. If you look online you will see that these can be purchased in large quantities very cheaply, and in many variations. I like the look of glass with corks, but you may find it more suitable to use plastic tubes with screw-on caps. 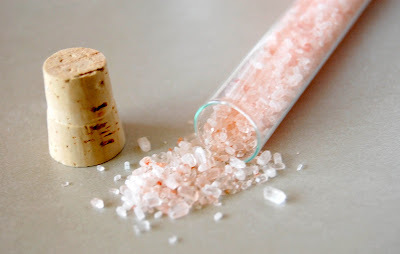 Rather than Test tubes, maybe you would want to place your bath salts in decorative mason jars. These could be different sizes as well, and make quite a nice table centerpiece, mixed with jars of flowers or candies. 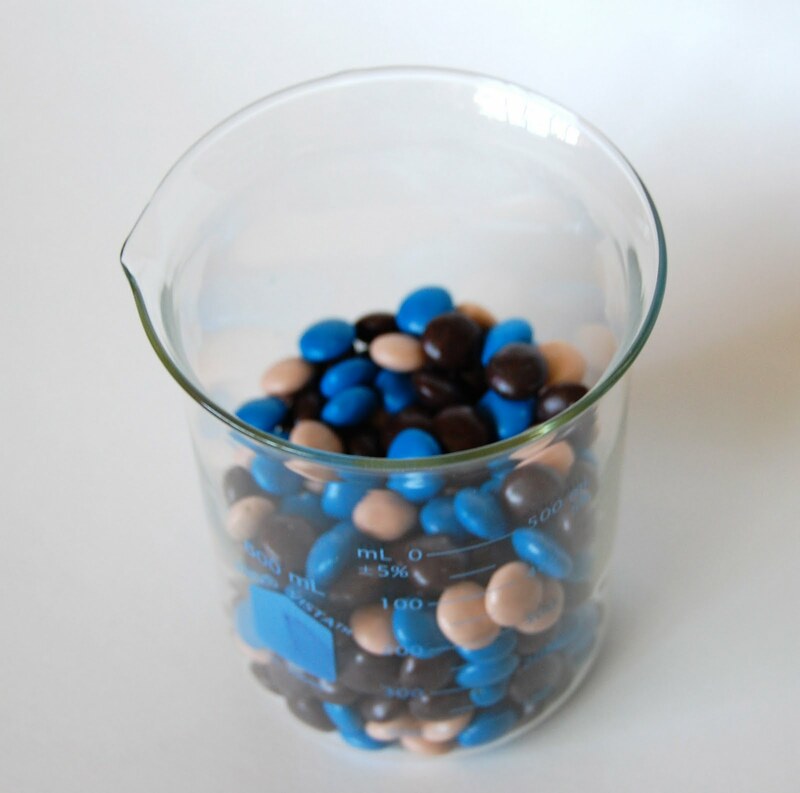 I also know that M&M's makes personalized candies that would work with this as well. You can get them in your wedding colors, or with images on them! 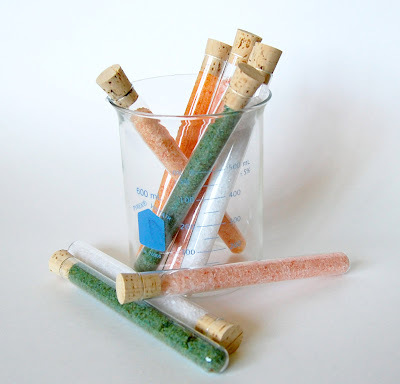 Test tubes would again be a great container, as they fill up rather quickly to keep the overall cost down, but still look great. Or fill larger containers so guests can nibble during the reception. I rarely listen to the radio when I'm in the car and it just so happens that the one time I did recently the DJ was talking about how "bath salts" were now illegal in Indiana. I was so confused. I later found out Bath Salts are a narcotic. I had to laugh a little then, when I saw this post. Not the same thing I know, but I still find it funny. But I'm weird that way. Thanks for the Foodbuzz add. Really? I had no idea, and while yes, these are definitely not the same thing, I think that's kind of funny. I actually used to live in Indiana, they certainly seem to be on the cutting edge of what will get you high. <3 the packaging! I appreciate the mention of purchasing test tubes and beakers and such online. It's much cheaper to purchase the new stuff. I've seen old 'used' chemistry glassware at various antique shops for crazy amounts of money. $8 / test tube. Seriously? And not to mention, who knows what type of chemical contaminants may be still in the pores of the glass. Especially if you'll be using the glassware for foodstuff. Yeah, you definitely want to buy new test tubes or jars, etc. No telling what has been stored in used stuff, and again, if you are making bulk party favors for a wedding or large party, the prices for bulk test tubes, brand new, are very low (not to mention you get to choose if it is breakable glass and whether or not it comes with some kind of stand/rack for display). I love this website. As a fellow crafter, I'm always looking for ideas! I like the test tubes. :) I was wondering if the ingredients are just mixed together and also how to use the mixture. Yep! you just mix it all together (I typically have some old spoons I use only for non food projects). Then, you just add the mixture to warm water, or your bath and soak away! I was looking for presents and I found this. I wasn't sure what Epsom salts so I did a bit of googling and found out that they are mainly magnesium sulfate something (something used all the time in chemistry labs) but I never realised it was actually good for you and that you can even absorb it (in solution) through your skin! I think I'll be making a lots and keeping some for myself! Great idea for bath salts that will help you relax.... Not eat someone's face off! Glass is non-reacting, nothing would be absorbed by the glass, and as long as you're up to date with sterilization techniques (just boil it) then you will be fine. Epsom Salt is Magnesium Sulfate, that's correct. Magnesium is essential to your health! It is one of the most abundant minerals found in the body, with about half of that amount being found in body tissues and organs (YES skin is an organ!)!! So it only makes sense that your skin will love you for using Epsom Salts. BUT THAT'S NOT ALL! Magnesium Sulfate (Sulfate just means salt of sulfuric acid, which is corrosive, so please do not ingest) is used to treat Preeclampsia (high blood pressure) in pregnant women, it helps to alleviate muscle tension and Restless Leg Syndrome, AND it is used to prevent eclamptic seizures!